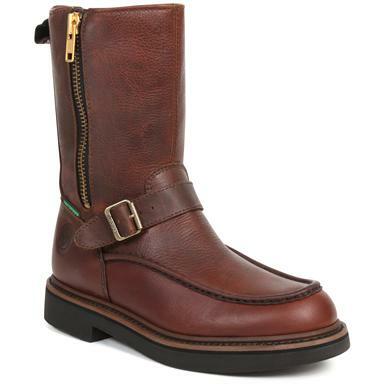 Georgia® 10" Side-Zip Wellington Waterproof Work Boots. Rain or shine, you're covered. Step into these weather-tough Work Boots for comfort assurance no matter what Mother Nature dishes out. Built with waterproof full-grain leather uppers and sealed seams, then lined with waterproof material for bone-dryness you can trust when the weather turns nasty. Super comfortable too, with the removable polyurethane orthotic insert that supports your arch to help ward off soreness. Each Work Boot weighs approx. 31 oz. Get 'em ONLINE, right here! Mens Georgia Side-Zip Wellington Waterproof Work Boots, Copper Kettle is rated 4.1 out of 5 by 37. Rated 5 out of 5 by Great Plumber from Great Boots all Around For Christmas Ive purchased my Husband a replacemant G4124. He loves his Georgia Boots. We have been married 14 yrs. He wears these boots Everyday for work. Most saturdays also. This style works for him. he has been wearing this Georgia boot style Many yrs. we buy 1-2 a year. Rated 1 out of 5 by Jessie C from soles came apart and crumbled. I've had boots for 5 or 6 years and wear them a few times every winter to keep my feet warm. I put them on today and the soles started crumbling and falling apart. the boots have not been abused and still look new. Rated 5 out of 5 by Flatbed Matt from Size and comfort I've always been a Georgia Boot fan so naturally when my last pair finally went out I found the side zip work Wellington. I love the style, and funcinality of the boot, comfort is better than my last pair, I got wide size to wear with "boot socks" fit like a glove! I am a flatbed truck driver so climbing on and off of trailers and being on my feet comfort and function are most important to me. All around great boot! Rated 5 out of 5 by IdahoGlenn from Very Comfortable! I’ve had these boots for 6 months, and am very happy. They are comfortable, great in all weather conditions. Will definitely buy again, if and when these need replacement. Rated 4 out of 5 by Benson28 from Great boots Been very pleased with my purchase. Boots are very well built and constructed ! Rated 5 out of 5 by NightTracker from Darn Good - Boots I have worn these boots for approx. (1) yr. and had several compliments and ...Where did you get them from ? I can tell you straight-up...They are very good feeling and not as heavy feeling as one might think. The $price$ is somewhat up there but,It is true...you get what you $Pay$ for.Made tough and a darn-good feeling boot. Rated 5 out of 5 by GaFarmBoy from I buy a pair every 2-3yrs. They are built to last. Not as comfortable as other boots I've owned when brand new. example: the top stitching chafes my calf til they're more broke in..but they do break in eventually. Usually the liner starts to pull loose after a cpl years. That's when I replace them. Still plenty of sole left and the leather really holds up well. I farm. So they are worked hard and get exposed to mud, chemicals and fertilizers daily. I'll continue to buy them. 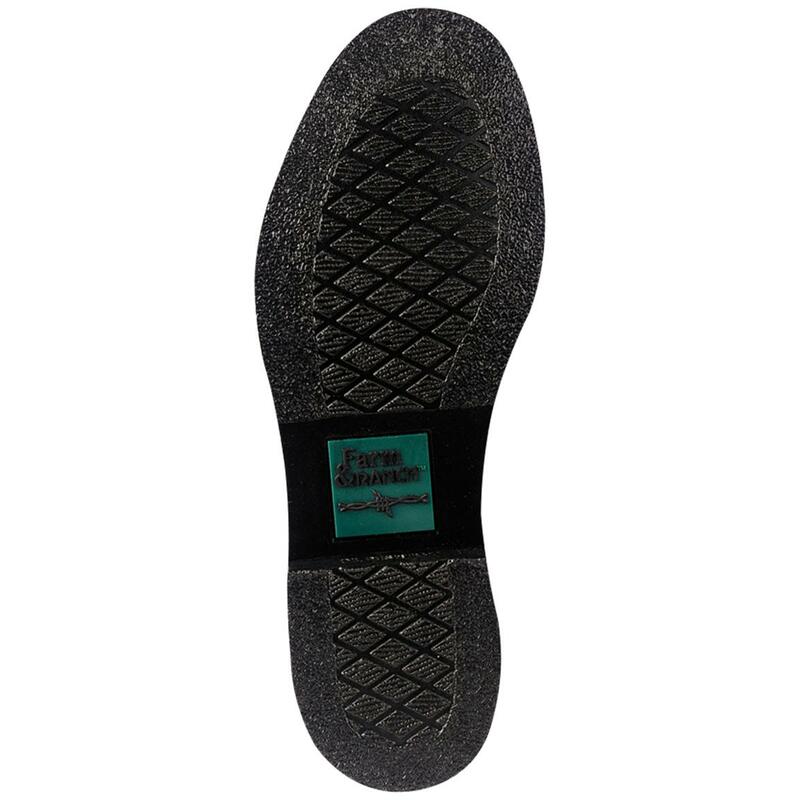 With a Net Fit “ICE” Breaker rubber outsole. Rugged Western flair for the workplace!